Today is my second blog anniversary. Can't believe it has already been that long. Thanks for taking this journey with me, without you it wouldn't be the same! Happy Blogaversary Nina! I just recently started following your blog but really look forward to many future posts. Oh, and I love the colour palette you have chosen for your dining room. Happy birthday to your blog! I'm looking forward to many many more posts. 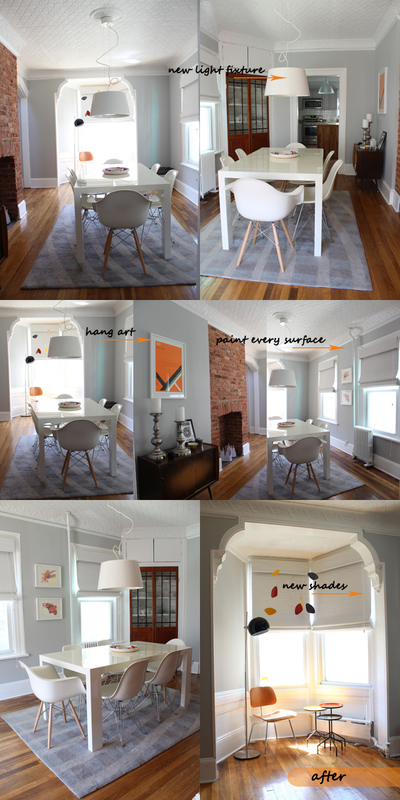 And that is an amazing transformation of the dining room. How are those chairs, as far as comfort? Happy blogday!! What an accomplishment. That is an amazing transformation. I love how light and airy it is, and that little nook is to-die-for. Props! Happy Blog-day! What a fantastic make-over. So fresh! I love the colours you have chosen and of course the Scandinavian furniture! What an amazing transformation!!! ... I luv seeing before and after photos - glad that u r posting them!!! Your dining is so beautiful, I kind of like it even before, it has such a lovely bones, but you've made it look so much better. Erin, the table is made by Calligaris, we found it in a store in Manhattan. It's the most expensive item of furniture we've ever bought but we were able to get a good deal and found it on sale. These pictures really are amazing, as is your whole house and all the hard work and creativity you put into it! I just can’t believe how much light you have managed to inject into the room! The rug and the oversized silver candle sticks are my favourite features! Happy belated blogoversary! I follow your blog since I first stumbled upon it and I'm impresed how amazing all your projects have turned out. But beware - one day I'll book a flight and come over to steal your chairs!